The frontal (L. frontal = brow) bone lies in the region of the brow. Its shape is similar to a shell. The orbital plate joins on every side the lower part of the squamous part. The junction of these 2 types is the supraorbital margin. The squamous part presents external and inner surfaces. The external surface above every supraorbital margin presents a curved elevation named superciliary arch. A rounded bulge between the medial ends of 2 superciliary arches is named glabella. Above the superciliary arch the external surface shows an elevation referred to as frontal tuber or eminence or tuberosity. The internal surface is deeply concave and presents a median bony ridge termed frontal crest that is continuous above with the sagittal sulcus. It’s the portion of bone which projects downwards between the left and right supraorbital margins. It presents a nasal notch, which articulates inferiorly with the 2 nasal bones 1 on every side of median plane and laterally on every side with frontal process of maxilla and the lacrimal bone. Every orbital is a triangular curved plate of bone going horizontally backwards from the supraorbital margin. It creates majority of the roof of the orbit. Both orbital plates are divided from every other by U-shaped ethmoidal notch for adapting cribriform plate of the ethmoid bone. One on every side, it goes downwards and laterally from the lateral end of the supraorbital margin. 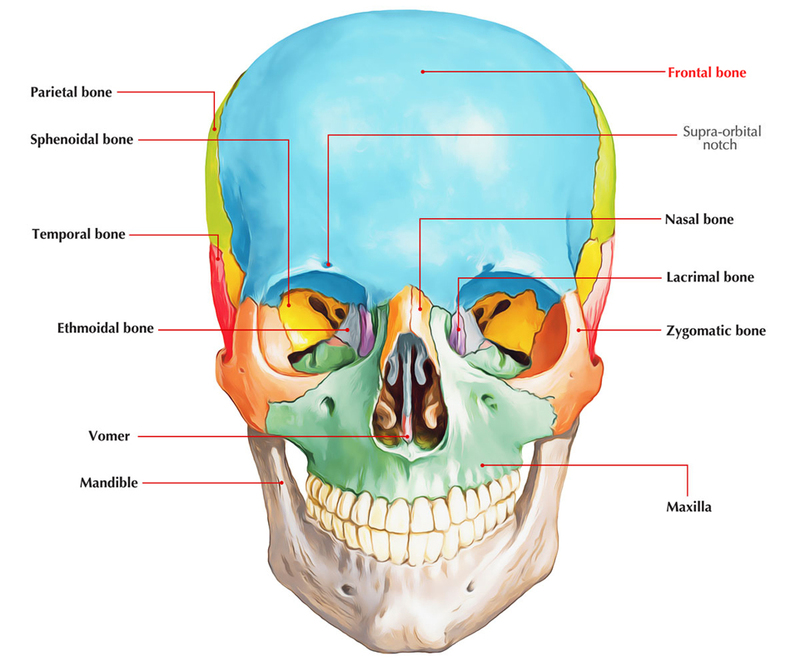 The zygomatic process joins the frontal process of the zygomatic bone. From the posterior margin of every zygomatic process the temporal line arch upwards and backwards and divides into superior and inferior temporal lines. The frontal bone ossifies in membrane. The primary centers appear 1 for every half of the frontal bone in the region of frontal tuberosity. At birth, frontal bone is created from 2 halves, divided by a median frontal suture. The union between the 2 halves starts at second year and generally finishes by the end of the eighth year. The remains of this suture in the adult in many cases are observed in the region of glabella. It’s referred to as metopic suture. The fracture of orbital plate of frontal bone results in hemorrhage into the orbit. The hemorrhage assumes a triangular shape underneath the conjunctiva with apex in the direction of the cornea and base in the direction of the orbital margin. The frontal squama is prone to fracture. In neonates and babies, it’s a depressed fracture (a dimple in the bone), on the other hand in adults it’s a fissured fracture, i.e., the depressed area consistently reveals an unusual line of fracture at its periphery.